Floren stated, “Investments of mere cents per resident each year in weights and measures regulatory oversight return millions of dollars of protections from fraud and negligence in the marketplace. While total expenditures for regulatory oversight in the County of Los Angeles amount to just over one dollar per resident per year, approximately eighty cents of each dollar are provided by regulated businesses through annual fees used to support programs to ensure that they can compete fairly. Residents and consumers are provided countless protections at an average cost to taxpayers of only twenty cents each per year. It is worth noting, by taxpayers and legislators who represent them, that they, as consumers, could lose much more than that in a single trip to the store or gas station without the protections and assurances that weights and measures programs provide.” As an example, at $4.00 per gallon for gasoline, a one-percent inaccuracy in a typical 20-gallon purchase can result in an 80-cent overcharge in that single transaction. As gasoline prices rise, so does the difference that even a 1-percent inaccuracy can make. Most consumers take for granted that they get what they pay for. As it may seem “common sense” that a gallon must be a full gallon or a pound a full pound, the “common cents” investments in these programs from funding partnerships with business operators and pennies per capita of County general funds ensure the confidence that can be held in commonplace transactions. Weights and Measures Week provides a reminder that equity in the marketplace exists largely through efforts of inspectors working behind the scenes. The Department of Agricultural Commissioner/Weights and Measures has jurisdiction over a staggering array of marketplace processes and devices, including petroleum fuel meters, utility submeters, vehicle odometers, taximeters, LPG meters, and all grocery, butcher, jewelry, postal, truck, luggage, and shipping scales. Inspectors order removal of inaccurate devices from service until repaired and re-verified, while also performing routine and undercover purchases at grocery and retail stores and gasoline stations to compare prices charged to prices advertised or posted on store shelves and to ensure that scales and meters are used in accordance with laws and regulations. Inspectors also check labeling and quantity accuracy of all types of packaged goods, ranging from foods, beverages, and office supplies to building materials and textiles. The National Conference on Weights and Measures is a professional nonprofit association of state and local weights and measures officials, federal agencies, manufacturers, retailers and consumers. NCWM has developed national weights and measures standards since 1905. The organization brings appropriate and varying interests together to keep pace with innovative advancements in the marketplace. 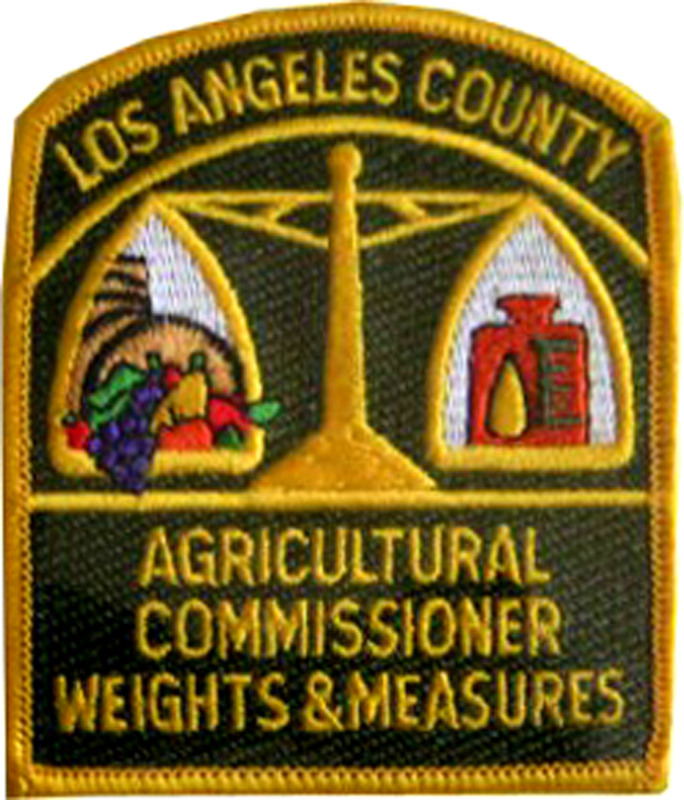 Established in 1881, the County of Los Angeles Department of Agricultural Commissioner/Weights and Measures protects consumers and the environment through early detection and exclusion of dangerous, invasive insect and plant pests; enforcement of laws and regulations regarding safe pesticide use; operation of an environmental toxicology laboratory; clearance of weeds, brush, and debris from vacant land to reduce fire hazards; inspection and verification of accuracy of scales, meters, price scanners, and quantity labeling on packaged goods.